The future of Wright State University is sitting in this room. You can just feel it. It’s a session of the Wright Leader Academy, an ambitious pilot program designed to incubate the next crop of senior leaders at Wright State. The group includes budding leaders from the Graduate School, Raj Soin College of Business, College of Education and Human Services, College of Engineering and Computer Science, and the offices of Marketing, Pre-College Programs, Institutional Research and the Registrar — 12 units in all. It is the brainchild of Shari Mickey-Boggs, associate vice president and chief human resources officer. 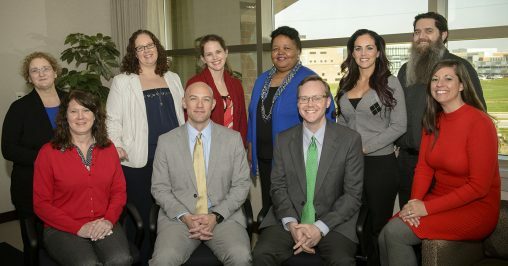 “Our key goals in developing this program were to provide high-performing employees a chance to grow their leadership toolbox, to strengthen collaboration among participants through relationship building and to facilitate a pipeline of talent that has a broad university perspective and willingness to promote a culture of excellence” said Mickey-Boggs. The full-day, once-a-month leadership sessions began in September and will conclude in May. On this particular day, the group is learning the skill of accountability and how to use their core strengths to take initiative and ownership in order to produce the desired results. Core strengths include such qualities as being ambitious, persuasive, competitive, sociable, analytical, open to change, risk-taking, self-confident, trusting, flexible, persevering, forceful, caring and cautious. The participants in the room are asked to identify their top strength and how they used it recently. One used her adaptability to deal with a last-second meeting that forced her to cancel a flight to a conference. Another used his ambition to sign up for two graduate programs, including an online program offered by Harvard University. Leading this session is Emily Hamman, Human Resources business partner and staff labor relations director. She challenges the group to think about which of their core strengths to use in a situation and to analyze their actions and how they could have done something differently. The participants then are asked to define their roles and responsibilities in high-stakes situations, such as projects with pressing deadlines or that require the approval of multiple stakeholders. “We will have leaders that are prepared, leaders that are trained, leaders that are thinking holistically about the institution,” said Hamman. Craig This, director of the Office of Institutional Research, said the sessions have given him a new perspective and some valuable networking. The leadership sessions typically start with presentations by outside subject-matter experts. Then leaders from Wright State talk about their leadership styles, how their areas connect to the mission of the university and the trends facing higher education in the function they oversee. The participants have heard from Mickey-Boggs and General Counsel Larry Chan; Thomas Sudkamp, provost; Steve Berberich, associate provost, Rebecca Cole, vice president for advancement; Jeff Ulliman, vice president for business and finance and chief financial officer; Robert Fyffe, vice president for research and dean of the Graduate School; Mary Ellen Ashley, vice president for enrollment management; and other senior leaders. The participants were selected because they demonstrated an ability to contribute and lead change at Wright State. They have been asked to serve on various committees in order to give them more training and leadership opportunities. Academy organizers are preparing to open the application process for the next group. Participants in the pilot program are This; Mark Anderson; director of web development and strategy; Seth Bauguess, director of communications; Tony Bourne, director of College of Engineering and Computer Sciences enrollment management; Sylvia Brockman, director of Total Rewards; Brenda Dewberry, director of Pre-College Programs and Upward Bound; Tina Heigel, university controller; Beth Hersman, director of the Adapted Physical Education Program; Amy Jones, director of Annual Giving; Amanda Spencer, assistant director of Academic Advising and Enrollment Management; and Amanda Steele-Middleton, university registrar. For more information visit wright.edu/human-resources/professional-development/the-wright-leader-academy.